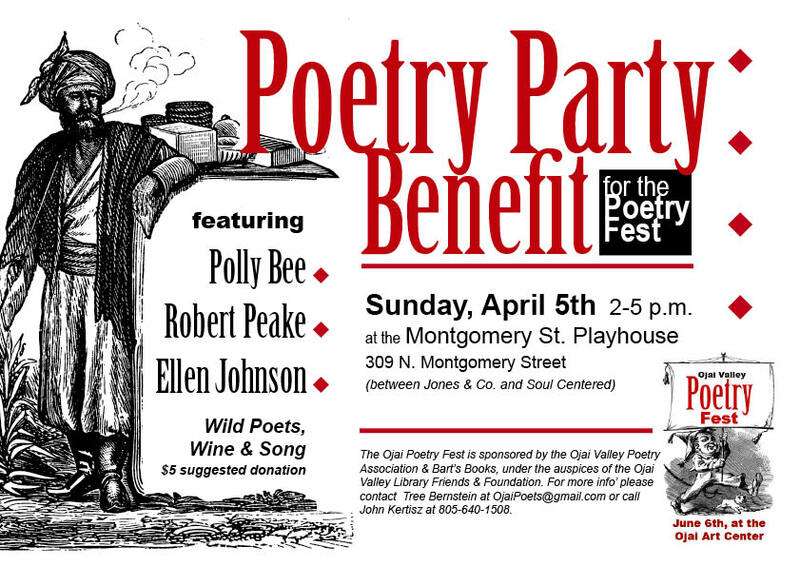 The Montgomery Street Playhouse will be hosting a benefit for the Ojai Valley Poetry Fest on Sunday, April 5th from 2?5 PM, featuring poets Polly Bee, Robert Peake, and Ellen Johnson. The playhouse is located at 309 North Montgomery Street, between Jones & Co and Soul Centered. Suggested donation is $5. Beverages and light refreshments will be served alongside well-chosen words. The Ojai Valley Poetry Fest is a grass-roots effort to keep the spirit of the Ojai Poetry Festival alive, featuring poetry, workshops, and events on June 6 at the Ojai Art Center. For more information, please contact Tree Bernstein at OjaiPoets [AT] gmail [DOT] com, or call John Kertisz at 805-640-1508. Categories: Community, Poetry, and Readings. Tags: Ojai Poetry Festival, Ojai Valley Poetry Fest, and The Montgomery Street Playhouse. Poets: Tree Bernstein. Ojai Poetry: the Show Goes On!